After I attended the Groovy/Grails Experience in February this year, I realize that the Groovy builder pattern can be used to façade many other API's (not just Swing). So, I decide to create, yet another builder, for the JMX API and here it is! Jmx Builder is a DSL designed to work with the Java Management Extension (JMX) API. Jmx Builder uses the builder pattern to facilitate the capturing and exposing of beans for runtime control and management via the MBean server.The Groovy JMX Builder DSL hides the complexity of working with the JMX API by providing a set of natural constructs to decorate your beans for management via JMX. Ability to expose any class instance for management including Java and Groovy classes. No need to implement a specific management interface. 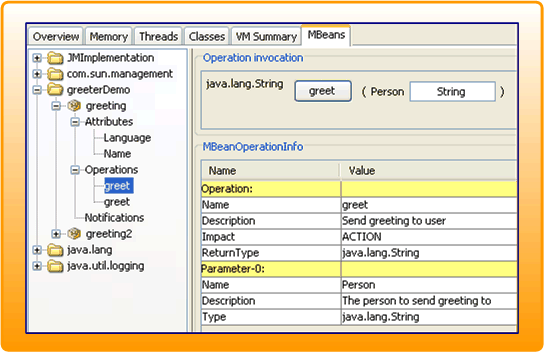 The following example shows how you can use Groovy JMX Builder to expose a regular Java class for management into the MBean Server. String greet = (String) (langs.containsKey(getLanguage()) ? The code above shows two ways to expose your bean for management. The first one is the explicit way where all manageable members of the bean instance is declared for management. Both constructor and operation support parameter nodes to describe method params. JmxBuilder() will automatically expose all public members of the bean for managment. So, visit the project's website and download the binary at http://code.google.com/p/groovy-jmx-builder/. Report all bugs or issues at the project's site under the "Issues" tab.